Yammer, the enterprise social networking company that was recently bought by Microsoft for $1.2 billion, is getting ready to add a new instant messaging feature called Online Now to its main service, enabling users to chat to each other in real time. Online Now will sit alongside existing services that let users post status updates and media as well as send private messages. The feature was spotted earlier today by TNW, and we have now confirmed exactly what is happening with Yammer itself, including the name: “We will be announcing the chat feature through a press release in a couple of weeks as part of our summer release,” a spokesperson told TechCrunch. If you are one of Yammer’s five million users and haven’t spotted an option to chat already, that’s because the chat that is coming out now is part of Yammer’s testing process. Yammer says that it has been implementing different versions of the upcoming User Interface (UI) and randomly displaying them to our users to test it. “Analytics will then show how users are adopting the various feature versions and we will make the decision based on those results so we can then roll out the best possible product to our customers,” the spokesperson said. The addition of a new chat feature demonstrates that Yammer is wasting no time sitting on its $1.2 billion laurels post acquisition by Microsoft . But nor is it rolling out products that point to it integrating with its new parent and its sister divisions so quickly, either. “This is a Yammer developed feature. You will be able to use it within your normal Yammer environment,” the spokesperson said. Meaning: no Skype integration, no Sharepoint integration, and if anything a wider enhancement of Yammer’s own functionality and feature set. 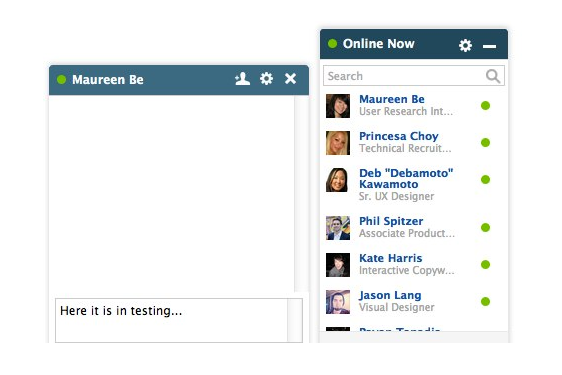 One possibility for how Online Now will work — although, again, this may change before the final product comes out — is that it will feature as an additional tab in the lower right hand corner of the main Yammer communication screen, not unlike Facebook’s own instant messaging feature. Now all we need is some auto-refreshing action on the main feed and we might just be in business.